One of the important criteria in choosing an acoustic flooring membrane is mechanical performance. It must be ensured that the product meets the mechanical criteria (thickness, density and internal cohesion) of the selected floor covering, here the ceramic. Too often, this aspect is neglected by consumers, while it is just as important as acoustic performance. Neglecting this aspect in the choice of your acoustic membrane can lead to expensive but unfortunately frequent problems, such as microfractures or cracking of tiles or ceramic joints, potentially coupled with the non-applicability of its manufacturer's warranty. 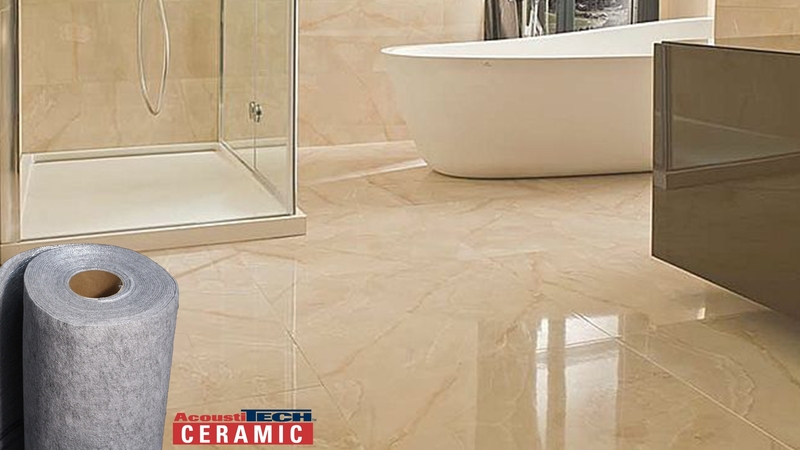 It is inadvisable to opt for a membrane that is too thick or too soft, or whose mechanical strength is not enough to retain the movements of the ceramic floor caused by normal variations of the subfloor, moreover, you could opt for the bad choice of adhesive. A 7mm membrane (eg the AcoustiTECH 7000 membrane) is not recommended when installing a ceramic, marble or natural stone floor. We recommend our AcoustiTECH Ceramic membrane, in conjunction with the AD-280 adhesive, which is specifically designed to block crack transfer and is compatible with electric and hydronic radiant heating systems. Finally, it is necessary to verify the maximum thickness that the subfloor can have under the manufacturer's warranty, which also includes many recommendations for the subfloor that can be installed under the floor covering. These are all restrictions that you must respect for the manufacturer to honor the warranty in case of problems.